The ketubah (Ashkenazic pronunciation kesubah) is the marriage covenant — a sacred commitment between a Jewish husband and wife affirming their devotion to each other. It is also a halachic legal contract, stating the groom's responsibilities to his bride for all the years of their life together and in the event of divorce or of his death. The ketubah was developed by the Sages of the Mishna, 2500 years ago, in order to protect the Jewish wife and ensure her future. The ancient art of illuminating ketubot, a tradition of the Jewish people for hundreds of years, was almost lost to the 20th century. However, in recent years, this medium has flourished once again and is more popular than ever. Using calligraphy to beautify the text itself and a variety of designs to enhance and illuminate it, the ketubah is a unique document expressing a couple's hopes and dreams. In commissioning a custom ketubah, you will choose both a design and a text that best reflects your ideas and goals. 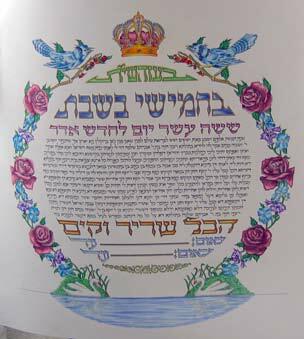 In the tradition of Jewish artists throughout the centuries, Chaim J. Bernath illuminates and illustrates each ketubah by hand. He uses gold- and silver-tone illumination and permanent, lightfast artist pencils along with inks and pastels, on the finest acid free paper or imitation parchment paper. Each ketubah is executed by hand according to your exact specifications.